My inspiration to make duck sausage started 2 years ago when I was competing in Jimmy’s No. 43 Cassoulet cook-off. I can go on and on about Cassoulet and will this coming January when it is Cassoulet competition time once again. Sausage is really not that difficult to make and can be a fun process. There are many advantages in making your own sausages. 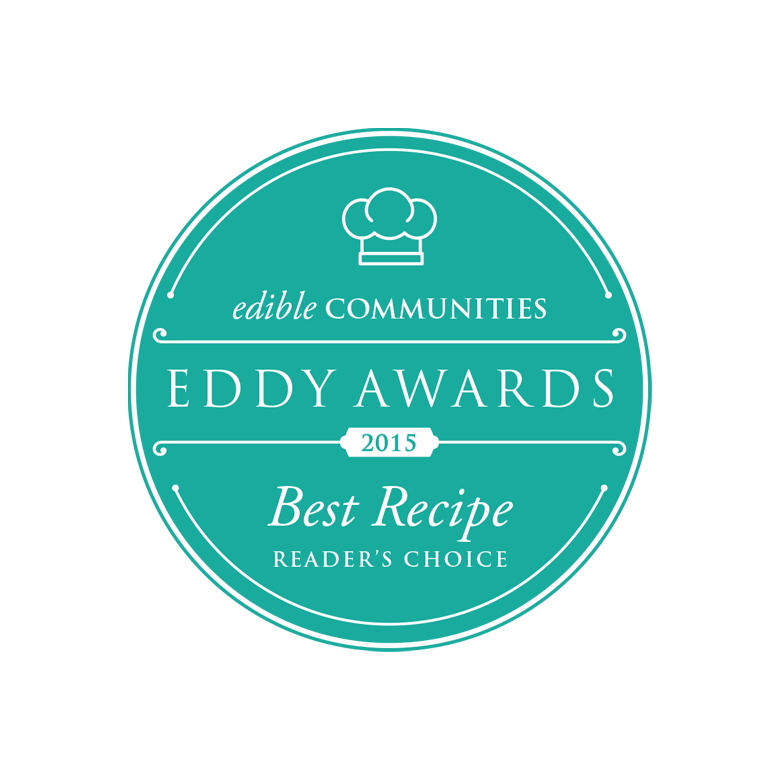 You are in control of your own ingredients and can create your own personalized recipe to suit your taste. You can use any type of meat, either by itself or with one another. Your sausage mixture should consist of both lean meat at 60% and fatty meat at 40%. Common herbs used are: basil, oregano, marjoram, parsley, rosemary, sage, savory, thyme and mint. Common spices used are: allspice, chili, coriander, cumin, ginger, mace, nutmeg and paprika. Some sausages may include a splash of spirits to add flavor and can act as a preservative too. You can create sausages which are stuffed into natural casings or you can try your hand at making patty-style skinless sausages as I have for this recipe. The easiest device to use to make sausage is one with an electric grinder. My stand mixer works well and has a grinder attachment with 2 different size grinding plates course and fine. You simply turn the machine on at a low speed, push the meat down the feed tube with the pusher provided, and catch the ground meat into a bowl. This recipe is a great autumn dish. The cheddar in the polenta paired with the duck sausage that has apple and currant undertones is devine. The autumn compote which is slightly sweet contrasts the rich and creamier flavors nicely. Duck is a lean meat. Be sure to use a mixture of breast and thigh meat because the breast on its own can be a little dry. Soak the currants in apple jack whiskey for at least 1 hr. Any liquid leftover will be used for the sausage mixture. Prep the herbs, spices and shallots then set aside. Cut the meat and pork fat back into 1 inch cubes and disperse together in a bowl. Refrigerate the meat mixture for at least 1 hour so it is chilled before putting through the feed tube to be ground. Have the grinder on low speed, use the course plate and press the meat through the feed tube into a bowl. Once the meat is in the bowl then add all your remaining ingredients that are at the ready and fold together so everything is evenly dispersed. note: it is best to refrigerate the mixture overnight to allow the flavors to develop. Also if you do not have access to apple jack whiskey or would rather not use spirits you can omit and replace the soaking for currants with water. Scoop up the prepared sausage and roll mixture into a ball between your palms. Pat the ball to flatten into a patty shape. It should be about 2.5 inches wide for this recipe. In a non-stick pan cook each side of the sausage patty on medium heat. Once done set aside for later assembly. note: depending on the size of your sausage patty depends on the cooking time. For this recipe each side took 2-3 minutes. Lightly oil a casserole dish with 1 tbsp of olive oil which can hold a 1 inch high pour of polenta and have at the ready. Bring water, milk, 1 tsp of salt and 1 tbsp of olive oil to a rapid boil. Lower the heat to a simmer and slowly add the polenta and whisk rapidly to keep polenta from clumping. Once all the polenta is combined begin to add the cream, cheddar and butter. Whisk until all ingredients are dispersed. Add the fresh thyme and pepper. Let the polenta cool in the refrigerator for a few hours before cutting. You can as well refrigerate polenta overnight. When ready to cut use a 2 3/8 fluted round cutter. In a non-stick frying pan place 1 tbsp of olive oil over medium heat. When hot sear both sides of the polenta until it is golden brown, approximately 2 minutes on each side. When done remove and place on dish for assembly. note: these fluted cutters typically come in sets which are used for pastries, biscuits and cakes. I find the 2 3/8 smaller cutter works well for this recipe. Preheat oven on bake for 350 degrees. Peel the apples, acorn squash, butternut squash and turnip. Cut into small cubes. Cut the red onion in half. Slice into thin semi rings. Place half the items above and the cherries into a baking dish. Drizzle the items with 1 tbsp of balsamic vinegar, 1/2 tsp of salt and pepper and make sure everything is coated evenly. Repeat 4 and 5 above with the remainder of the ingredients minus the cherries. This mixture is going to be pureed for the dish. Bake vegetables and fruit until tender for 20-30 minutes. Take the one mixture with the cherries and set aside at the ready. Place other mixture into a small pot with 1 cup of water and puree over low heat. You can either do this with a hand held immersion blender or a counter blender. Place the cheddar polenta on the plate and place a tsp of the puree mixture on top. Then place the sausage patty on top of the puree and then top it off with the autumn compote. As I was sitting in the middle of 11,000 day old ducklings Douglas Corwin, President and 4th generation Duck Farmer of Crescent Duck Farm was proudly admiring and speaking to the newborns in what appeared to be duck language which sounded like this, "Bup! Bup! Bup! Bup!" It was as if the ducklings innately knew what he was saying, as they were climbing up his legs frantically, racing for the highest point. 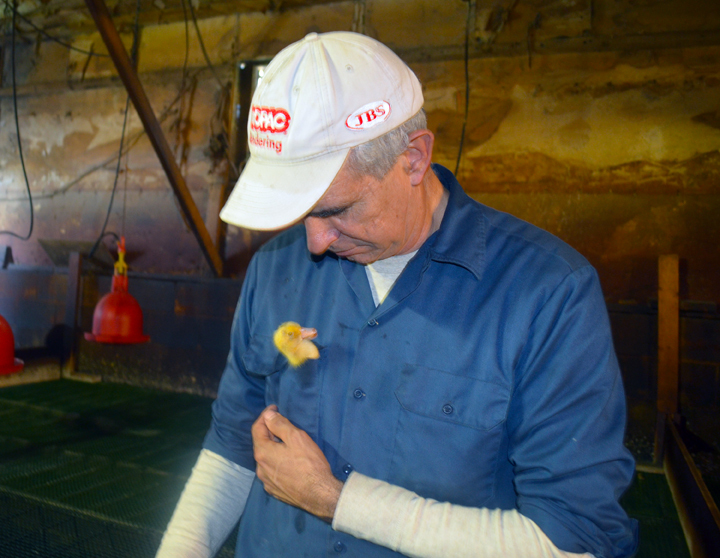 It would be no surprise if these ducklings understood every word considering this family affair of duck farmers dates back to 1908 and the land where the duck farm resides has been in the family since the middle of the 1600's. The 145 acre duck farm produces 1 million ducks a year for 4.5% of the countries duck produce for the more discerning white tablecloth restaurants and asian food trades. 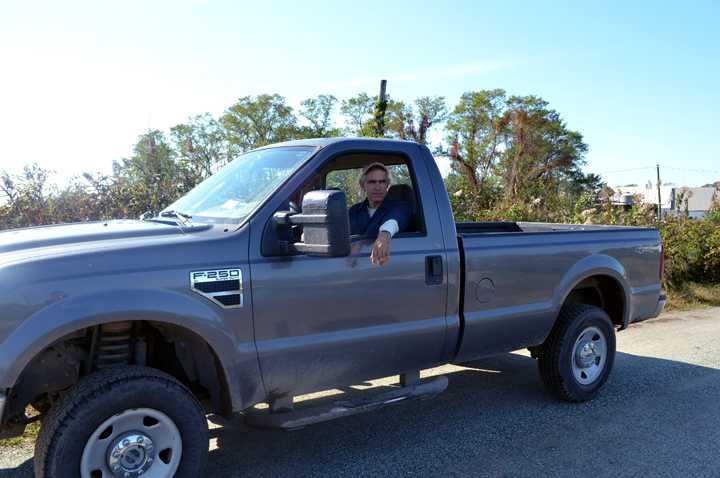 Douglas shared with me his family history and passion for the duck farm as he gave me a tour from his ford truck. We bumped along the dusty trails, passing the 22 or so duck structures which are used for breeding, hatching, growing and processing. Douglas stated to me proudly, "For my entire life this farm has been my home!" When I asked where he lived he stated, "On the other side of the farm." He then proceeded on sharing with me the various family members who live along the circumference of the farm and pointed to this white house in the distance where Douglas' oldest son lives. This home happened to be his great, great grandfather's from the 1940's. At that moment I wished my head was able to spin 360 degrees as it was hard for me to keep track of where each family member lives. Depending on where we were along the tour I was either holding a duck egg in my hand which hatched before my eyes, standing amongst thousands of ducks ranging from newborns - 6 weeks old or breeding ducks. When I asked about the variety of Ducks on the farm Douglas stated, "Pekin! The history of the Long Island Duckling began in 1873 when Pekin ducks of unusual size were brought over from China to the USA; one drake and 3 ducks made its way to NYC and these 4 ducks happen to be the Crescent Ducks Ancestors, known as the Long Island Duck." Crescent Duck Farm was named by Douglas' great, great grandmother. It was named after the creek which is crescent shaped and sits alongside the farm. 30 years ago, there were 40 duck farms in the Eastport area, 75 miles east of Manhattan. 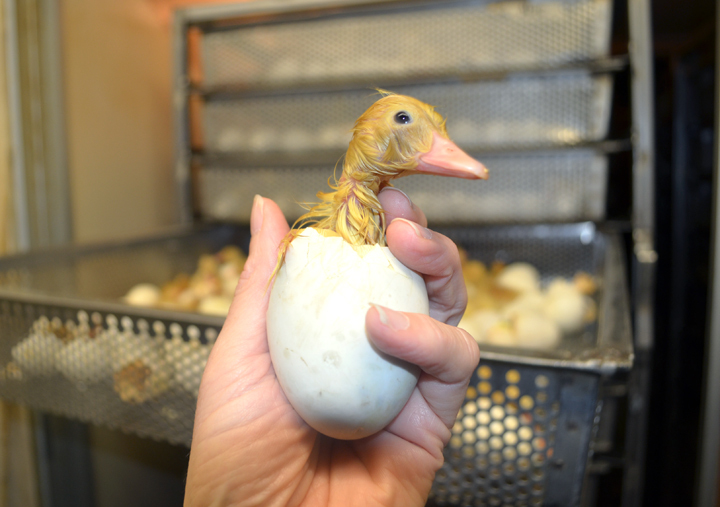 Of the eight million ducks produced nationally, more than six million per year came from Long Island. The humid climate, abundance of fresh running water and sandy soils is why Ducks were raised on Long Island. Today, Crescent Duck is the only major producer that remains. The birds are fed a unique diet of natural grains without hormones or artificial growth stimulants. to the right: Corwin Tombstones with the ducks engraved. We happened to drive past the Old Steeple Church Cemetery which sits along the farm. Douglas pointed to 2 tombstones which had the family name Corwin and a Duck engraved on both. One was where his grandparents are buried and the other is his Father's plot. As I was photographing the cemetery Douglas stated, "My grandfather was my hero, mentor and idol growing up, he was gregarious and everyone like him. My Father on the other hand is more business like and reserved." These traits which Douglas described about his Grandfather and Father are very much ingrained in him. I saw an individual who is very proud about his family heritage and legacy. He was a Cornell graduate like his Father, both who immersed themselves in the intensive study of chemistry, biology, physics, nutrition, genetics and business. His Grandfather's gregarious nature was evident as he was excited to share with me what he holds close to his heart; the love of his duck farm and family. The culmination of his lifelong study of raising the perfect duck for the culinary industry combined with his genuine outgoing nature and nurturing quality has set the standard in the industry. This is evident by the business he keeps. Crescent Duck Products are being prepared at award-winning restaurants such as The Four Seasons, Jean-Georges, Bouley, The River Cafe, Momofuku and the majority of the restaurants which are out east on Long Island. His duck products have set the standard in the industry, being consistent and having a flavor profile which is succulent, meaty and tender. I know first hand as I have had a Crescent Duck Breast prepared for me by Chef Keith Luce of Luce & Hawkins in Jamesport, NY on the the same day I did this tour. I asked Douglas if he had one wish for the future of his farm what would it be? He simply stated, "For his son's to continue the family legacy of the Crescent Duck Farm on Long Island and to keep providing healthy discernible tasting ducks for years to come. note: Crescent Duck Farm products can be purchased at the Bayview Farmers Market in Aquebogue, NY. Crescent Duck Farm is a wholesale production facility and not open to the general public. Recipe coming up: Duck sausage with cheddar polenta and an autumn compote. With much anticipation, I finally dined at Luce & Hawkins which has been long overdue. My first visit to the Jedediah Hawkins Inn in Jamesport, NY was this past May. I attended an opening reception for our friend and artist Charles Wildbank at the Barn Gallery which sits behind the historic Victorian Inn and happens to face a Potager Garden that Chef Keith Luce has created for the Inn's Kitchen. At the time I knew nothing about Chef Luce or his restaurant Luce & Hawkins. The Garden, however was beginning to tell me a story about what to expect if I was to dine there. I noticed the pathway through the garden was lined with Hazelnut shells which clearly defined a natural walkway and probably used to keep the weeds in check. This hazelnut pathway enticed a passerby like me to peruse amongst the lavender, grape vines and rosemary. It was as if the garden was carefully and thoughtfully measuring my every step, the crunching sounds beneath my feet were reminiscent of a clicker counter tallying up the anticipation of how long it would be before I would take a seat at a table in the dining room. As I was leaving the garden I got a glimpse of the kitchen staff at work and knew they must have been creating quite a symphony for what was to come that evening. I never forgot about that garden and said to myself I would be back to take a seat at Luce & Hawkins. Five months later, I did. My husband and I had a reservation for 8:30pm and we decided to arrive early for a cocktail to take in the prime time service vibe before we sat down to our meal. I learned that Chef Luce's first passion was music and I would say it was quite evident upon entering the restaurant, it felt as if we walked into the middle of a symphony; the hostess, bartender, wait staff and managers were working together, balanced and poised. Chef Luce happened to come out of the kitchen to have a conversation with the bartender. Knowing his surroundings so well, he turned around and welcomed us to his restaurant as if he knew us for years and made us feel very much at home. Earlier that day I visited with the Crescent Duck Farm and knew Chef Luce served their product. I thought to myself, "What a great way to cap off this day with tasting a Crescent Duck breast prepared by Chef Luce!" We sat down promptly at 8:30pm and was greeted by our waitress Shannon who has been working at Luce & Hawkins since May the same time I came across the kitchen garden. She was an absolute delight, a local from Mattituck, NY with a passion for making her own chocolates with homemade Jam. Her competency and training was evident as she was happy to accomodate my curiosity with such questions as: Did chef make his own butter? Where is the bread from? Is the cheese accompanying my salad from Catapano Dairy Farm and are these KK Haspel's greens? She was an integral part of the Luce Symphony, being the face for the kitchen to answer the various questions one may have. Many years ago I used to be a waitress at the Inn at Quogue in Quogue and it reminded me how the chef would instill in us the importance of understanding where the ingredients came from and to be the story of the restaurant. I gathered what we were about to have would tell a wonderful story about the north fork region. The Harvest Salad with baby lettuce, farm stand veggies, goat cheese and a farm egg. The creaminess of the goat cheese was a nice contrast to the baby greens and veggies. The egg yolks were fire orange and fresh as can be! These simple local ingredients was a perfect starter for our palates for what was to come. Crab Cakes with micro-greens was up next which was the special appetizer of the evening. I can taste Chef Luce's French culinary influence in this dish, the texture was velvety with a touch or horseradish which gently coated the crab and the sear on top was the perfect amount of crunch to counter the smoothness. Hand cut tagliatelle with cauliflower, roasted tomato, capers and breadcrumbs. You can taste the eggs from Chef Luce's chickens in making this pasta which was light and fresh. The sweetness of the roasted tomatos, fresh cauliflower bits and the brines from the capers with a touch of breadcurmbs was a nice combination. I now understand what Douglas Corwin the CEO of Crescent Duck Farm meant by his product being discernibly different. Chef Luce honored this duck breast with the utmost care and perfection. It was meaty, yet succulent with a perfect sear. The cherry jus complemented the duck beautifully, which melted in your mouth. Bravo. I am very fond of risotto and it happens to be one of my signature dishes, but I have to say this was very well executed and probably the best risotto I have ever tasted. This dish sung autumn to me, the silky arborio rice coddling the nutty taste of the Farro with the autumn vegetables nestled in these pillows of creaminess was perfect. Maybe one day if I am lucky Chef Luce will show me how to make this dish. Who would have ever thought to make bread pudding out of croissants. This was not my first choice and frankly was probably my last choice. However, Shannon the waitress suggested we must try this and so we did. Thank You Shannon, for letting us in on Jamesport's newest best kept secret the croissant pudding. To my surprise it was light and buttery with moments of melted chocolate and the rum raisin ice cream simply topped it off. Our meal told us a story about Luce & Hawkins and the chef behind these creations. A historic place, with a team that has strong neighboring sensibilities, honoring and caring for the freshest of ingredients with respect to the local environment. If you are taking a trip to the North Shore of Jamesport to visit Jedediah Hawkins Inn it is a must to visit the garden and walk the hazelnut path to make sure you take a seat at Luce & Hawkins sooner than later.